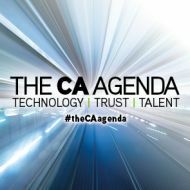 Technology, Trust and Talent: at a time of great change for the profession, for business and for society as a whole, ICAS is looking to stimulate thought and action in these critical areas through The CA Agenda, a new thought leadership initiative. Whether it’s the far-reaching consequences of technological advances in the forms of automation, AI, blockchain and robotics, or the roles that each of us can play in rebuilding trust in business and eroding practices not fit for the future, all our members can realise the extent of their own talents in making this vision a reality. This ambitious programme saw its launch in London on 5 March 2019 at St Paul’s Cathedral. Introducing the event, ICAS Chief Executive Bruce Cartwright CA said: "This is our agenda – one way or another, these are the issues that most people in the room will be facing. "We are on our own journey at ICAS to ensure that the CA qualification and the professional development we provide remains highly relevant to the environment our members operate in." 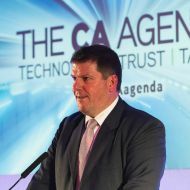 Baron Anyangwe CA, an ICAS Council Member and Management Consultant with North Highland, introduced three leading CAs, each outlining key issues in Technology, Trust and Talent. Hugh Shields CA, who spoke on technology and how it will affect all of our lives, is Global Director (Accounting) with Huawei Technologies and ICAS Special Consultant, Technology and AI. He challenged the audience of CAs: “Imagine a world in which robots can do virtually all jobs that exist today. If we can harness the upside and manage the downside of technology, ICAS can set the agenda for the accounting profession. In this environment, he said, when auditing and accounting can take place in real time, and analysts can be presented with fair value information as it happens, even concepts such as 'profit' will take on a different meaning and with integrated reporting having an ever more significant role, traditional financial accounting will no longer be the sole benchmark. Drawing on his work in commercial PLCs and in international NGOs working on development, anti-corruption and biodiversity, and now as Chief Executive of The Elders, a peace and human rights group, David Nussbaum CA addressed the issue of trust and the role of the CA. "We have a crisis of trust," he said and cited research findings from the 2019 Edelman Trust Barometer, a worldwide survey of public opinion. One of the survey’s most telling findings is that only 20% of the public believe the 'system' is working for them. We may not be able easily to change the system individually; but we can make choices about how we operate within it. "This is an issue for us, as accountants," David stressed. The solution often put forward is increased transparency, he added, but said that this is not an answer in itself, especially where there is perceived unfairness. Trust, he argued, is a matter of competence and integrity, or to put it another way, capability and behaviour. For the accountancy profession it requires ethical leadership: "Making choices: to put public trust above personal ambition… to address issues internally, where they occur, with courage and integrity; and also externally and sometimes publicly." He concluded: "We may not be able easily to change the system individually; but we can make choices about how we operate within it; and in doing so, contribute to changing it." Alison Cornwell CA, Group Chief Financial Officer for Vue International, asked: "How can we be relevant and succeed in a world where technology is taking over and the integrity of our profession is being questioned?" Third, by embracing and harnessing technology to look for ways in which technology can help professionals to do a better job and make work more stimulating... and by always behaving with integrity. She stressed the importance of “curiosity” and retaining a willingness to learn, at any stage in one’s career, talking with enthusiasm about the impact of certain technology projects her business had implemented. Her conclusion was upbeat, quoting from one of her favourite films, Dead Poets Society: "Carpe diem – ‘seize the day’ – and make your lives extraordinary." Mark Allison CA, ICAS Executive Director, Education, joined the panel and outlined the major changes in the ICAS curriculum taking place this year. 'Business Ethics and Public Trust' will appear as a separate exam paper from this May, and the new syllabus will include: a greater emphasis on scepticism and professional behaviours; and more content related to quantitative skills such as forecasting, measurement and data analytics. The new syllabus also comprises business acumen and commercial awareness, as well as cybercrime, artificial intelligence and the impact of disruptive technologies. It will have ramifications for continuing professional development (CPD), with an increased focus on capability rather than simply acquiring knowledge. Bruce Cartwright CA, concluded the discussion with a promise that this will only be the beginning for The CA Agenda. He said: "Please do get involved. The talent and intelligence that will help drive this programme is here in the room, within our wider membership in the UK and beyond and indeed the wider profession. "We want to support those networks and that knowledge sharing across our community."